There are tens of millions of stray and feral cats in the USA. Stray cats had homes at one point in time and are used to people, but feral cats find humans scary. Many cats form colonies in an area where they have access to food and shelter. People who live nearby may never even know the feral cats are there – they stay away. Strays often approach humans in search of help and food and are more often seen in daylight. TNR programs attempt to keep the number of community cats down through preventing them from reproducing. The cats are trapped humanely, brought to a veterinarian for spay/neuter, a basic health check, and are vaccinated against rabies. While the cat is under anesthesia for the spay/neuter surgery, the veterinarian removes the tip of one ear. It doesn’t bother the cat, and it’s a signal that says the cat has already been spayed or neutered, so it isn’t trapped and taken in again. Once all this is done, the cat is returned to its home area. Ideally, someone will watch over the colony, make sure the cats are fed, bring anyone who shows signs of injury to the veterinarian, and TNVR any new arrivals. Many rescue organizations around the nation provide TNVR services, free veterinary services for community cats, and free food for cat colonies. 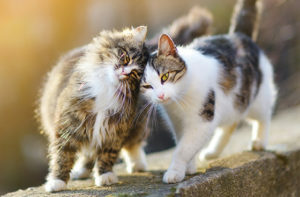 Some feel that euthanizing community cats would be a faster solution to the problem, but research from humane organizations has shown that it doesn’t work. There are too many homeless cats, and just removing a few creates a vacuum effect. That is, an area can only sustain so many cats, and when all the kitties there are spayed or neutered, the population will eventually wane. If cats are removed quickly, new cats will move in from other areas.